ABLE Instruments offer Xentaur ‘Model HDT’ dew point meters as the exclusive sales and service partner and calibration centre for Xentaur within the UK. The Model HDT Dew Point Meter uses a Xentaur HTF high capacitance aluminum oxide sensor with a measuring range of -100ºC to +20ºF or -60ºC to +20ºC. Customers can also request special ranges for special applications. 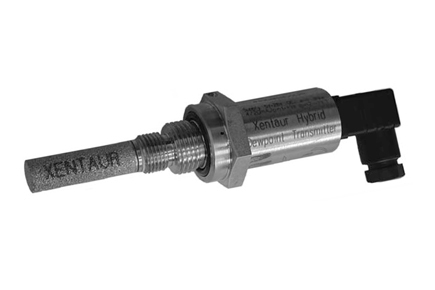 The Xentaur dew point sensors provide a high degree of accuracy, speed of response and stability unavailable from instruments using conventional aluminum oxide or polymer sensors. The HDT is a HART compliant dewpoint transmitter, providing loop powered analog as well as a digital output. Housed in a 32mm dia. Stainless steel housing it has an overall length of 136mm including the Industrial Standard 9.4mm 4-pin connector. The HDT transmitter uses a multipoint calibration table which provides temperature compensated dewpoint readings for temperatures from -10ºC to +70ºC with the option of going below -10ºC. Thus, the HDT provides accurate dewpoint measurements over its full range even under extreme temperature conditions, such as when installed outdoor or close to heat sources.